The rapid growth of renewable energy generation has been driven by two concurrent factors: the falling levelised cost of the energy produced by wind and solar, and the retirement of a number of coal-fired power stations. The recently released Finkel Review notes that by 2035, approximately 68 per cent of the current fleet of Australian coal generating plants will have reached 50 years of age. The Clean Energy Target proposed by Dr Finkel is not yet confirmed but it recommends incentives for technologies with low or zero carbon emissions. More renewable energy generation brings new challenges in an increasingly complex grid. Dr Finkel therefore also proposes that energy storage be mandated for solar and wind farms. Renewables can’t, on their own, meet the fluctuations in demand that occur throughout the day without some regulation as to when power reaches the grid. Power needs to be dispatchable. Dispatchable means that energy can be provided upon request. If the sun is not shining or the wind is not blowing, renewable energy cannot be dispatched unless it has been stored in some way. 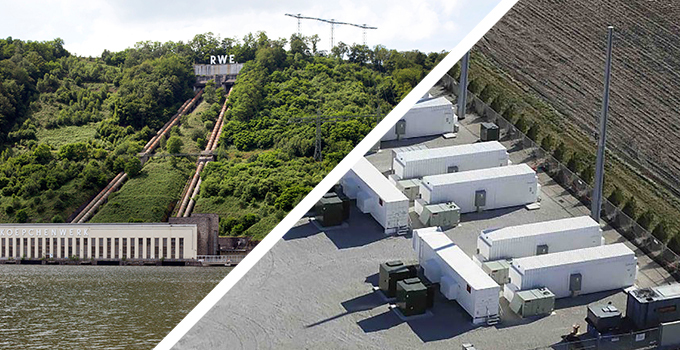 There are a number of different types of storage but the two being discussed most widely right now are batteries and pumped hydro energy storage. These two technologies are very different and there are some limitations involved in comparing a well-known and established technology with one that is new and developing rapidly. How do they support the network? Pumped hydro is based on well-established synchronous generation, providing critical ancillary services to the grid, through the provision of inertia, frequency and voltage support and sufficient fault level support. Battery inverter technologies are still catching up on most of these fronts. The potential for batteries to provide ‘synthetic inertia’ or fast frequency response is high but this is balanced by their reliance on system strength to be able to deliver this support. They offer minimal support with fault levels but can still provide some support to system frequency and voltage regulation. How fast can they happen? There’s no doubt that battery storage is quicker to implement than pumped hydro. South Australia has provided an example of just how quickly battery storage can be deployed. In March 2017, the South Australian Government called for expressions of interest for the supply of grid-connected battery storage to be connected by the end of 2017. The overwhelming response from 90 interested parties tells us that this speed of deployment is within the realms of possibility. Battery image courtesy of Greensmith, a Wärtsilä Energy Solutions company. Pumped hydro, by comparison, is a technology that takes much longer to implement. Typically, development activities (including optimising the technical solution, environmental and social assessments, arranging finance and finalising design) take two years or more to complete, and construction takes another two to three years. How do the capital costs compare? Pumped hydro boasts a very low price per megawatt hour, ranging from about $200/MWh to $260/MWh. Currently, battery costs range from $350/MWh to nearly $1000/MWh, with this cost reducing rapidly (costs reduced by about 25% during 2016). According to the Lazard’s Levelized Cost Of Storage report, capital costs for pumped storage projects around the world range from about $1.5 million to $2.5 million per MW installed. The report also reveals that the cost of installing a grid-scale battery solution ranges from about $3.5 million to $7.5 million. This wide range of pricing for batteries is typical of a developing technology that is implemented in a variety of applications. Ultimately, it’s difficult to predict how low the cost of batteries may go, but reports predict costs of lithium-ion batteries at somewhere around $120/MWh by 2025. Considering that batteries need to be replaced once or twice a decade, with the currently available technologies, a battery facility will need to be replaced a number of times during the potential 100-year life of a pumped storage project. For batteries, assuming an economic life of 40 years, the initial cost plus replacements may mean whole-of-life costs fall in the range of $200/MWh to $330/MWh. The rise of renewables will inevitably lead to a diversity of storage and supply solutions. The range of these solutions will depend on the resources of particular regions and locations. It is highly likely that the future for both batteries and pumped storage technologies will be extremely bright. Batteries are here to stay and will undoubtedly play a significant role in future power systems as the technology develops and costs fall. However, while batteries can provide fast response times, they are yet to demonstrate their ability to provide the full range of ancillary services needed to support the grid. Pumped hydro remains a landmark, proven and reliable technology, able to meet the needs of the grid and provide sustained output for up to a century. Ultimately, there is room for both batteries and pumped storage hydro, and they may even complement each other. Batteries are more cost-effective at delivering small amounts of stored energy over a short time at high power levels. Pumped storage is more cost-effective at storing and releasing larger amounts of stored energy. Achieving the optimum storage solution will depend on careful planning and finding the best fit for the particular circumstances. What is certain is that both technologies will play important roles in the development and expansion of a network powered by renewable energy. If you would like to discuss how Entura can help you with your next utility-scale battery or pumped hydro project, please contact Donald Vaughan on +61 3 6245 4279 or Nick West on +61 408 952 315. A version of this article was first published in RenewEconomy. Donald Vaughan is Entura’s Principal Consultant for Primary Electrical Engineering. He has over 20 years of experience providing advice on regulatory and technical requirements for generators, substations and transmission systems. Donald specialises in the performance of power systems. His experience with generating units, governors and excitation systems provides a helpful perspective on how the physical electrical network behaves and how it can support the transition to a high renewables environment. Nick West is a civil engineer at Entura with 16 years of experience, primarily in hydraulics and hydropower. Nick’s skills range from the technical analysis of the layout of hydropower projects to the preparation of contractual project documents and computational hydraulic modelling. Nick was a key team member of the Kidston Pumped Storage Project Technical Feasibility Study.